"Pretzel crisps are topped with warm cinnamon apples and ice cream and drizzled with caramel dip." Preheat oven to 350 degrees F. Cut each roll into 4 or 5 thin slices and place on a baking sheet lined with aluminum foil. In a small bowl, combine sugar and cinnamon. Brush top of each slice with butter and sprinkle with cinnamon sugar. Bake pretzel slices 5 to 7 minutes or until the edges are lightly golden. Remove from oven. In a skillet, melt 2 TBS butter; add apple pieces and cinnamon and saute apples 3 to 5 minutes or until tender. Place Marzetti Caramel Dip in a microwave dish and microwave in 10-second intervals until warm. 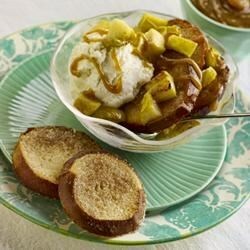 To assemble dessert, layer pretzel crisps with warm apples, ice cream and warm caramel dip and serve.